Top » Catalog » Forestry » Tests of the Pines "ponderosa" and "jeffreyi" on the southern slopes of Sierra Nevada (Granada-Spain). Years 1922-1962. Tests of the Pines "ponderosa" and "jeffreyi" on the southern slopes of Sierra Nevada (Granada-Spain). Years 1922-1962. 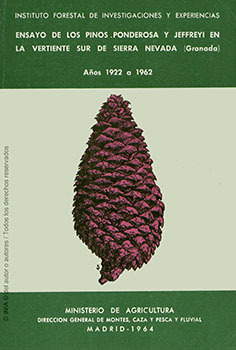 In this work are discussed the experiments of acclimation of "Pinus ponderosa" and "Pinus jeffreyi" effectuated on the southern slope of Sierra Nevada during the period comprising the years 1929 when the first sowing in nurseries began up to August 1962 when the last inventories of the planted plots were realized. Physical Description : 128p. ; 17x24;il.